Automobile accidents can happen anytime without warning, but there are ways to reduce the chances of them happening to you. Many accidents occur because a careless driver could not see where they were going due to a blind spot. Most vehicles do not have ideal visibility, but some are much worse than others. If you drive a large vehicle like an RV, having at least a backup camera is essential. It only takes one lapse in judgment or an obstacle to your vision to cause an expensive and potentially dangerous accident. 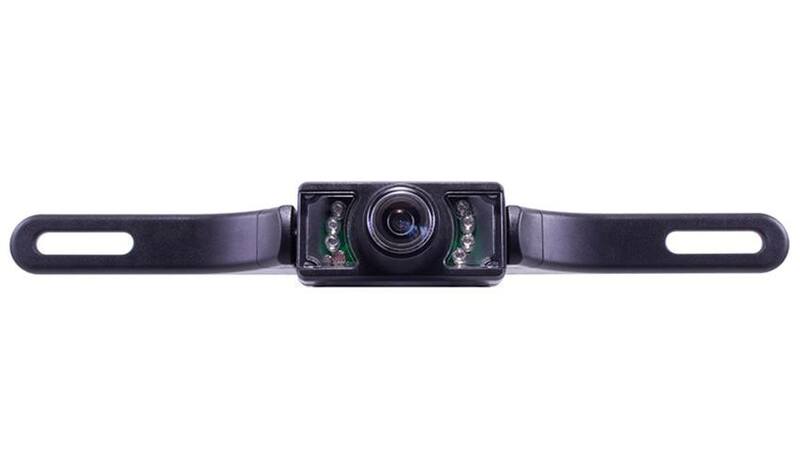 We have different styles of license plate back up cameras that will work for every type of vehicle, all our cameras have full color, night vision, 100% water proof and come with a 120 degrees viewable angle. These standard features can be upgraded by using the “Customize and Upgrade” section at the top of the page. There you can decide if you want your camera to wired or wireless with a range of 70ft+. The standard definition license backup camera is the economical version of our license plate series. It fits any license plate and has a color CMOS lens with standard night vision. This backup camera is waterproof and yes, you can put it through a car wash. These backup cameras will fit the license plate of any standard vehicle, they can be mounted on the top or bottom of the license plate. The lens on the camera is Hi-Definition (CCD) and uses our best low light technology for the night version. It's available in 3 colors, Silver (Chrome), Metallic Black, and Piano White. This license plate camera is a high definition camera with full color and night vision but it also has 2 parking sensors built into its frame. This gives you the best of both world because you have the benefit of seeing everything behind you, and you have audio feedback telling you when you are too close to an object. All this without having to drill holes in your bumper. This is a license plate camera with a standard definition lens (Upgradable to Hi-Def) its special because of the type of night vision is has. Instead of using LED light to soak in the light available, this camera has 4 high powered LEDs that project light backward this way you can see behind you with real light. will fit any standard European license plate. features a universal euro size frame with numerous holes for easy installation. There was a time when a License Plate Backup Camera was considered a luxury item, but those days are gone. Today, these devices are considered standard on any large vehicle, and many motorcycle, car, SUV, and truck owners have started using them too. The reasoning behind this is simple – using a backup camera makes your vehicle that much safer. Today's cameras are surprisingly affordable, so there really is no reason to continue just hoping for the best. Installing a backup camera is a simple way to prevent accidents, making it a sound investment that will inevitably pay for itself. So what makes our License Plate Backup Camera the best? There are quite a few answers to that question. First of all, these cameras can take a hit. You never know when you might catch some debris flying by, and our cameras are made to be tough enough to handle whatever gets thrown at it. The weatherproof casing ensures that even the rainiest night won't prevent its use. This durable camera is definitely in it for the long haul. Toughness is one thing, but performance is just as critical. Fortunately, our License Plate Backup Camera has the goods on the inside too. You can expect crystal clear image quality so that you never have to second-guess your next move. The color display provides you with vivid visuals. The mirrored image makes transitioning from standard mirrors to a monitor seamless and familiar. Our cameras are intuitive, simple to install, and they just feel right. You don't need to be technically savvy to be able to enjoy this user-friendly technology. Many drivers prefer to use a complete camera system for maximum visibility. This is especially important if you are driving a vehicle like an RV or bus with limited visibility. At Tadi Brothers, we have plenty of different kinds of cameras to choose from, all of which are compatible with each other. You can have a backup camera, front end camera and two side cameras all active. You can even set them up for simultaneous viewing, or you can choose to switch between them by pressing a button on the monitor. If you have any questions about our License Plate Backup Camera or any of our other vehicle cameras, please do not hesitate to give us a call at (866) 966-5550. Our knowledgeable staff is always happy to help you in any way possible, at any time of day or night. When you shop at Tadi Brothers, you get more than great bargains and quality products. Our dedicated staff is committed to making your shopping experience positive in every way. Order online today through our secure website. "I am satisfied with this camera, it was not expensive and it does exactly what was promised it has good night vision and good daytime picture." " I recently purchased a mini Cooper and despite its size I noticed that there is an much visibility in the back, after spending all this money on the car the last thing I wanted was to buy an expensive camera so I purchased this camera with a 3.5 inch monitor. So far it is solve my visibility issues I'm very happy with it and quite honestly people think it looks neat. I recommend this for people that have cars low visibility to good camera and reliable "
" I have been using the camera for over three months so far I am satisfied, my only complaint is that the charge me extra to get the grid lines. I do find them very useful but I don't think I should've been charged extra. However I am still very happy with the camera and I recommend other people to try it."